Besides fat, acting as the body’s long-term energy storage, skeletal muscles are of great interest to study, and the balance between the energy-consuming muscles and the energy-storing fat compartments is, of course, highly relevant in order to understand the metabolic balance of the body. Cachexia, involuntary loss of body weight, usually with disproportionate muscle wasting, is a life-threatening condition, often related to the progression of an underlying serious disease (eg, cancer22). In cancer, cachexia is defined as weight loss of >5 per cent over 6 months, BMI <20 kg/m2 or appendicular muscle mass normalized by body height squared of <7.26 kg/m2 or 5.45 kg/m2 for males and females, respectively.23 Sarcopenia, which can be related to cachexia, but is also associated with aging, is often defined as reduced physical performance following loss of muscle mass, usually accompanied by increased fat infiltration of the muscles.24 When diagnosing sarcopenia, muscle strength tests combined with muscle volume measurements are needed.25 Furthermore, Willis et al showed that muscle pathology progression over 1 year could be detected by quantitative MRI but not by assessing muscle strength or function.26 These examples illustrate the need for more sophisticated body composition analysis tools that go beyond simple anthropometric measures. The purpose of this paper is to give a brief introduction to the most commonly used methods for body composition analysis and a review of an MRI-based body composition analysis technique, comparing its performance to other methods. This includes a previously unpublished validation study of the agreement between this method and dual-energy X-ray absorptiometry (DXA). A number of different techniques for body composition assessment have been developed, from very simple indirect measures such as waist-to-hip ratio and calipers to sophisticated direct volumetric measurements based on three-dimensional imaging techniques. There are also a range of invasive or in vitro methods for body composition analysis such as inhalation or injection of water-accumulating or fat-accumulating agents, or dissection and chemical analysis of cadavers. This overview will, however, focus solely on non-invasive in vivo measurement techniques. Hydrostatic weighing (underwater weighing), or densitometry, is based on Archimedes’ principle. The difference of the body weight in air and water is used to compute the body’s density. Assuming a two-component model with different densities for fat mass and fat-free mass and correcting for the air volume in the lungs, the total body fat percentage can be estimated. Obviously, this technique cannot give any measurements of the distribution of AT or lean tissue (LT). ADP is perhaps better known under its commercial brand name BOD POD (Life Measurement, Concord, California, USA). Similar to hydrostatic weighing, ADP measures the overall body density and hence total body fat and LT but not their distributions. By putting the body in an enclosed chamber and changing the chamber’s volume, the volume of the displaced air (ie, the volume of the body) can be determined from the changes in air pressure. Since ADP is based on the same two-component model as hydrostatic weighing, it is also affected by the same confounders, mainly variations in bone mineral content (BMC) and hydration. Due to the limitations of the two-component model used in densitometry and ADP, a four-component (4C) model is often recommended.28 29 In addition to fat and LT, the 4C model also takes BMC and total body water (TBW) into account. However, these two additional components have to be measured by other techniques (eg, DXA for the BMC and deuterium oxide dilution for TBW30) The repeatability (coefficient of variation (CV)) of ADP for body fat has been reported to be between 1.7 and 4.5 per cent when measured within 1 day.31 Obviously, ADP, as well as hydrostatic weighing, is limited to gross body composition analysis, not making any estimates of regional fat or muscles. DXA has been found to be more accurate than density-based methods for estimating total body fat.41 A possible confounder is that the DXA analysis assumes a constant hydration of lean soft tissue, which is not always true as hydration varies with age, gender and disease.42 Excellent repeatability (CV) in the range 1–2 per cent for body fat and 0.5–2 per cent for LT has been reported for DXA. CT gives a three-dimensional high-resolution image volume of the complete or selected parts of the body, computed from a large number of X-ray projections of the body from different angles. The known differences in attenuations of X-rays between lean soft tissue and AT can then be used to separate these tissues, as well as to determine mixtures between them. As opposed to the previously described techniques, CT can accurately determine fat in skeletal muscle tissue16 and in the liver.44 It is, however, significantly less accurate for liver fat <5 per cent which limits its use to diagnose low-grade steatosis.44 Being a three-dimensional imaging technique, CT has the potential of giving direct volumetric measurements of organs and different AT depots. In practice, however, CT-based body composition analysis is in most cases limited to two-dimensional analysis of one or a limited number of axial slices of the body, leading to the utilization of the area measured as a proxy for the volume. There are two reasons for this limitation: first, it is important to keep the part of the body being scanned to a minimum in order to minimize the ionizing radiation dose.45 This is particularly important in the ethical considerations of research studies on healthy subjects. Second, manual segmentation of different compartments in the images is a very labor intensive task, which can be reduced by limiting the analysis to a few slices rather than a complete three-dimensional volume. This approach, however, limits its precision since the exact locations of slices, in relation to internal organs, cannot be determined a priory and will therefore vary between scans. Nevertheless, CT, together with MRI, is today considered the gold standard for body composition analysis, in particular regional. MRI uses the different magnetic properties of the nuclei of certain chemical elements (normally hydrogen in water and fat) in the cells to produce images of soft tissue in the body. A number of MRI-based methods for quantification of AT (eg, see the review by Hu et al 46) and muscles47–52 have been developed and implemented in the past. By using so-called ‘quantitative fat water imaging’, precise measurements of regional AT and LT, as well as diffuse fat infiltration in other organs, can be obtained. The basis for quantitative fat water imaging is fat water separated, or Dixon, imaging,53 where the different magnetic resonance frequencies of protons in fat and water are used for separating the two signals into a fat image and a water image. Due to a number of undeterminable factors affecting the MR signal, an MR image is not calibrated on an absolute scale and therefore not quantitative in itself. But by using different postprocessing techniques, the image can be calibrated to quantitatively measure fat or AT. Examples of such methods are proton density fat fraction (PDFF)54 measuring the fraction of fat in MR-visible soft tissue and fat-referenced MRI55–57 measuring the amount of AT in each voxel. Body composition profiling implies the simultaneous collection and analysis of a number of body composition parameters, including subcutaneous and visceral AT, ectopic fat such as liver and skeletal muscle fat and muscle volumes. Fat-referenced MRI is a methodology that enables all such measurements in one single rapid examination. This section gives a brief introduction to body composition profiling using fat-referenced MRI, together with a review of published validation results of the method. Finally, a previously unpublished validation study of the agreement between this method and DXA for measurements of body fat/AT, body LT and VAT is presented. The body composition profiling methodology combines fat-referenced MRI with automated image segmentation of different compartments and was first described by Dahlqvist Leinhard et al. 55 Different aspects of the method have been further described in other publications.47 60–62 The two key features of this method are that it produces quantitative fat-referenced images and that it uses a supervised automated segmentation tool. In a quantitative fat-referenced image, the value in each image volume element (voxel) represents the amount of fat in that voxel in relation to the amount of fat in pure AT. Hence, a voxel in pure AT has a value of one and a voxel without any fat has the value zero. This means that the following can be measured: the total amount of AT in any given region by summation of the voxel values in that region, AT-free volume by removal of amount of AT from volume measurements of regional LT (eg, muscles) and fractions of fat in specific internal organs, such as the liver. The supervised automated segmentation tool enables an efficient way of segmenting different AT compartments, as well as different muscle groups, reducing the manual work to a few minutes, rather than hours, for analyzing a whole-body data set. Anatomical compartments, such as the visceral compartment and different muscle groups, are automatically segmented using predefined anatomical atlases and the operator can then adjust the segmentations if needed. An example of such segmentations is illustrated in figure 1. See online supplementary appendix 1 for a summary of how fat-referenced MRI is implemented in AMRA Profiler (AMRA Medical AB, Linköping, Sweden), which is the tool for body composition profiling that was used in the validation studies of fat-referenced MRI. In a previous study,61 the accuracy of body composition profiling using fat-referenced MRI, in terms of agreement with manual quantification of T1-weighted MR images, was evaluated on 23 (11 females, 12 males) subjects with an average BMI of 31.7±5.1 kg/m2 (range 22–46 kg/m2); age 36–66 years. There was no significant difference in the measured amount of VAT (4.73±1.99 vs 4.73±1.75 L, P=0.97). Furthermore, the agreement between the methods was excellent for both VAT (95 per cent limits of agreement (LoA) −1.06 to 1.07 L) and abdominal subcutaneous AT (ASAT) (−0.36 to 1.60 L). However, a very small yet statistically significant difference in ASAT was observed (10.39±5.38 vs 9.78±5.36 L, P<0.001). Clearly this small difference has no clinical significance. Test–retest repeatability and agreement with manual quantification for VAT was evaluated by Newman et al.63 The study included 30 subjects with five subjects from each gender for each of the following categories of BMI: 18–25 kg/m2, 25–30 kg/m2 and >30 kg/m2. Each subject was scanned twice with at least 20 min interval, during which the subject left the scanner room. There was no significant difference between the evaluated method and manual quantification of VAT (P=0.73). Bland-Altman analysis of the test–retest repeatability showed a bias of −0.04 L (95 per cent LoA −0.12 to 0.13 L) for VAT and 0.05 L (95 per cent LoA −0.55 to 0.64 L) for ASAT. The CV was 1.80 per cent for VAT and 2.98 per cent for ASAT using the method above. The CV for manual quantification of VAT was 6.33 per cent as a comparison. Middleton et al evaluated the accuracy and repeatability of VAT, ASAT and thigh muscle quantification by comparing with manual segmentation on 20 subjects.64 Due to the laborious work with manual segmentation, 15 two-dimensional axial slices were manually segmented in the abdominal region for VAT and ASAT and 5 slices over the thigh muscles. For repeatability assessment, the subjects were scanned three times, with the subject remaining in the same position on the scan table between scans 1 and 2 and with the subject removed from the table between scans 2 and 3. The intraexamination (scans 1–2) repeatability test obtained a CV of 3.3 per cent for VAT, 2.2 per cent for ASAT and 1.5 per cent for total thigh muscle volume. For the inter-examination test (scans 2–3), the CVs were 3.6, 2. 6 and 1.5 per cent for VAT, ASAT and thigh muscle volume, respectively. Good agreement with the manual measurements in the 20 slices was observed for all measurements. Neither the slopes nor the intercepts of the regression lines were significantly different from those of the identity lines. Test–retest repeatability of muscle quantification of left and right abdominal muscles, left and right, anterior and posterior thigh muscles and left and right lower limb muscles, as well as accuracy of lower leg muscle quantification, were evaluated by Thomas et al 65 comparing the method above with manual segmentation. The study included 15 subjects of each gender, ranging from normal weight to obese. Each subject was scanned twice with at least 20 min interval, during which the subject left the scanner room. The intraclass correlation (ICC) between the first and second scan was almost perfect (between 0.99 and 1.0) for all muscle groups. The 95 per cent LoA ranged from −0.04 to 0.02 L for the posterior thigh muscles to −0.15 to 0.08 L for the left lower limb. The lowest accuracy for the lower limbs was a bias of −0.08 L with 95 per cent LoA of −0.25 to 0.09 L.
Test–retest repeatability of measurements of VAT and ASAT volumes and volumes and fat infiltration of left and right posterior and anterior thigh muscles, lower leg muscles and abdominal muscles were evaluated by West et al on 36 sedentary postmenopausal women.66 Each subject was scanned twice, and the subjects were removed from the scanner room between the acquisitions. The intraexamination CV was 1.54 per cent for VAT, 1.06 per cent for ASAT, 0.8–1.9 per cent for volumes of muscle groups (thigh, lower leg and abdomen) and 2.3–7.0 per cent for individual muscle volumes. The 95 per cent LoA was −0.13 to 0.10 L for VAT, −0.38 to 0.29 L for ASAT. The LoA for liver PDFF were within ±1.9 per cent, and for muscle fat infiltration, they were within ±2.06 per cent for muscle groups and within ±5.13 per cent for individual muscles. The method’s reproducibility of fat-free muscle volume quantification between 1.5 T and 3 T MR scanners, as well as the agreement with manual segmentation, was investigated on 11 different muscle groups.47 The ICC between the automated method and manual measurements was at least 0.97 for all muscle groups except in the arms. Except for the arms, the ICC between 1.5 T and 3 T data ranged from 0.97 (left lower leg) to 1.00 (left posterior thigh) with a mean difference volume ranging from 0.39 L (95 per cent LoA 0.01 to 0.77 L) (left abdomen) to 0.0 L (95 per cent LoA −0.10 to 0.09 L) (right lower leg). The muscles of the arms had worse accuracy and reproducibility due to difficulties to include the arms in the field of view. Ulbrich et al 69 investigated the agreement between fat-referenced MRI and BIA on 80 subjects between 20 and 62 years with a BMI range from 17.5 to 26.2 kg/m2. The linear correlation between body fat mass measured by BIA and AT volume measured by MRI was 0.75 and 0.81 for females and males, respectively. The total AT measured by MRI was converted to total fat mass (again assuming that most of the fat resided in AT and using a constant density of 0.94 kg/L). Compared with MRI, the BIA underestimated the total fat with approximately 5 kg (±7 kg LoA) on average, this despite the fact that the MRI-based measurements of total body fat excluded the arms and lower legs. The highest linear correlation found between BIA and MRI-derived measures was 0.75 and 0.81 for females and males, respectively. These correlations were found between BIA-derived body mass percentage and the MRI-derived ‘total AT index’ (total AT divided by body height squared). The agreement between DXA and the fat-referenced MRI technique was assessed using data from the UK Biobank study,70 approved by the North West Multicenter Research Ethics Committee, UK, and with written informed consent obtained from all subjects prior to study entry. The age range for inclusion was 40–69 years of age. For the present analysis, participants were selected, out of the first 6214 scanned, who had both DXA and MRI scans. One subject with obviously erroneous DXA values (2.7 kg total fat and 6.8 kg LT) was excluded, yielding a total 4753 subjects (2502 females and 2251 males). All included MRI images were analyzable for VAT, ASAT and both thigh muscles according the predefined quality criteria.62 The BMI range was 16.4–54.3 with a mean of 26.2 kg/m2. Since the DXA and MRI analyses measure different entities (fat and LT mass vs AT and LT volume, respectively) and they do not cover the same part of the body, a linear model was estimated by linear regression between the MRI and DXA measurements using a training data set of 2376 randomly selected subjects. The remaining 2377 subjects were then used for estimating the agreement between the techniques after linear transformation using the linear model (ie, validating the linear model). 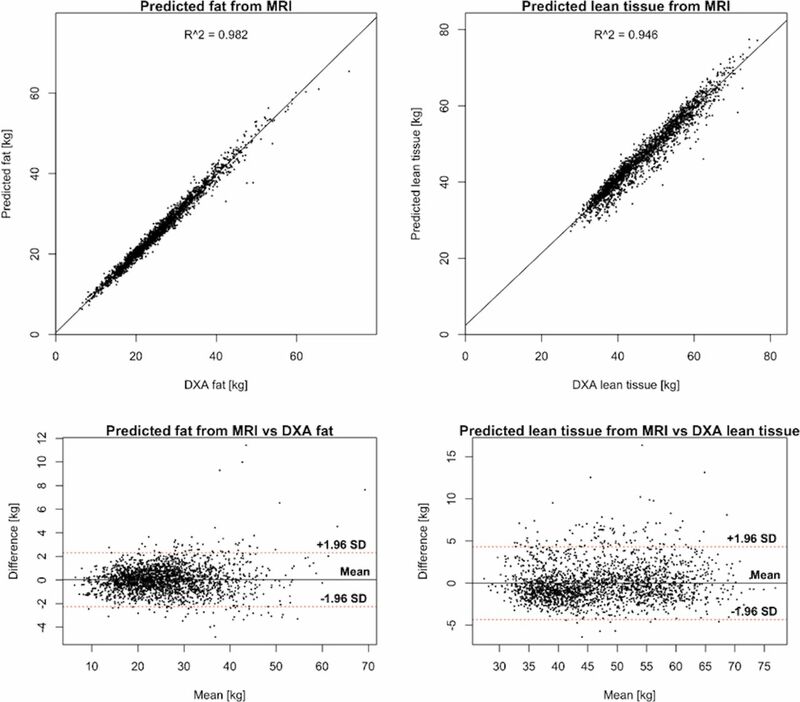 The MRI-based measurements (L) were transformed to predict the DXA measurements (kg) using the linear regression coefficients from the training data, and a Bland-Altman analysis was performed to investigate the agreement between MRI-derived and DXA-derived measurements in the validation data. To investigate the agreement between DXA and MRI-derived VAT measurements, a linear model was estimated between the DXA and MRI measurements. Of the 4669 subjects with available DXA VAT measurements, 2334 cases were used to estimate the model and the remaining 2335 subjects were used to validate the agreement between VAT measured by MRI and the transformed DXA measurements using Bland-Altman analysis. The linear regression between MRI and DXA was 1.23 x – 0.12 (kg/L) for body fat/AT and 1.88 x + 1.82 (kg/L) for body LT. The linear correlation coefficient, r, between DXA and the transformed MRI measurements was 0.99 for body fat and 0.97 for LT. The 95 per cent LoA from the Bland-Altman analysis were −2.25 to 2.31 kg for fat and −4.33 to 4.31 kg for LT (figure 3). The prediction error SD relative to the mean (CV) was 4.5 per cent for body fat and 4.6 per cent for LT. 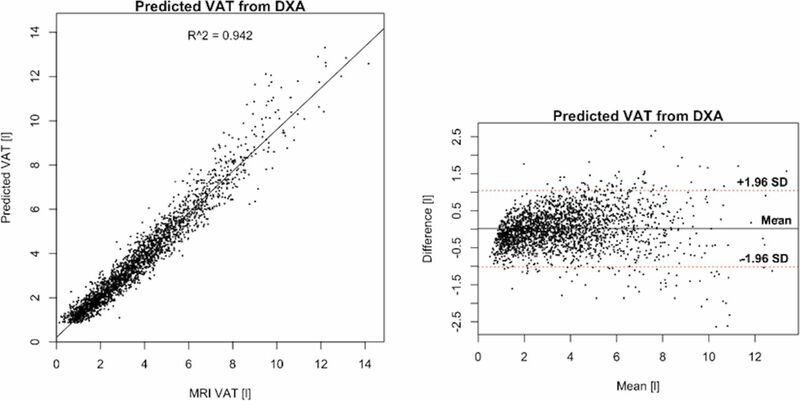 The correlation between VAT measured by MRI and VAT as predicted by DXA was 0.97 and the LoA were −1.02 to 1.05 L, with CV=21 per cent (figure 4). Densitometry, including ADP, shows relatively good precision and high correlation with MRI-based measurements of whole-body AT, but with a significant volume-dependent bias. Since these methods only measure the volume or density of the body, they cannot be used for regional measurements and body composition profiling. BIA is highly available and its relatively low cost is an advantage, which also makes it useful for consumer products. Furthermore, it can differentiate intracellular water from extracellular water, which is a unique capability of BIA. BIA can also, in principle, be used for regional measurements, but it is severely limited when it comes to measuring VAT or ectopic fat in internal organs. DXA techniques have shown good accuracy when evaluated against MRI for whole-body measurements and very good repeatability. The prediction of whole-body fat and LT from MRI agrees well with DXA after a linear transformation, but less so for VAT. While the correlation between DXA and MRI-derived VAT was high (r=0.97), the agreement after a linear transformation was, however, much lower than for total body fat and body LT, with a CV >20 per cent. The high linear correlation, despite a modest agreement, can be explained by the very wide range of measured VAT volumes, ranging from almost 0 to >14 L. The CV for VAT is in line with the results by Kaul et al with a CV of 15.6 per cent for females and 25.9 per cent for males when comparing the same DXA model with CT.72 Park et al found a linear correlation of 0.85 between VAT measured by DXA and MRI in a study including 90 non-obese men.73 However, Kamel et al found that the correlation was much lower (r=0.46) for obese men.74 The fact that the agreement is lower for obese subjects can also be observed in figure 4 where the prediction error increases with increased VAT volume. Silver et al found an excellent correlation without significant bias between fat water MRI and DXA for ‘gross body adipose tissue’ but with a significant negative bias (MRI – DXA) for ‘total trunk adipose tissue’ as well as total and trunk LT.75 Interestingly, for DXA, the lowest precision is for fat in the arms, with reported CV up to 11 per cent.76 This is the same compartment that is difficult to measure with MRI due to signal loss in the outer parts of the field of view. A strength with DXA, compared with MRI, is the simultaneous assessment of bone mineral density and mass. When comparing different technologies, both accuracy and precision are important. Accuracy, however, can be rather difficult to compare between technologies for several reasons. First, there is no ground truth available. Even though there is a growing consensus that tomographic methods are the gold standard that can be used to assess accuracy for other methods, they differ between themselves and are difficult to compare in terms of accuracy. Using physical phantoms is one way to assess accuracy, but they miss the difficulties caused by anatomical variations that we know can lead to different measurement errors. Automated tomographic imaging methods can be evaluated against manual methods, but this addresses only one of several important components in the measurement system—the segmentation of different compartments. Second, not all methods measure the same thing, so even if two technologies correlate strongly, there may be a significant bias if they measure different physical entities. For example, AT is not equivalent to fat—besides fat AT also contains water, protein and minerals. When comparing a method that measures AT in volume units, such as MRI, to a method that measures fat in weight units (eg, DXA), we have to convert one unit to the other using a density that is assumed to be constant, which again may not be always accurate. Although this review has not focused on measurements of ectopic fat, this is an important component in body composition profiling, especially for understanding metabolic status and assessing risk. Among the techniques discussed here, CT and quantitative MRI are the only methods that can quantify local diffuse infiltration of AT and ectopic fat. (Non-invasive measurements of ectopic fat, in particular liver fat, are commonly done by MR spectroscopy (MRS), but since MRS only measures local substance concentrations and not absolute amounts of fat, AT or LT, this technology was not included in this study.) While it is possible—and sometimes necessary—to use different equipment for different measurements in a study, it is often desirable to keep the number of different examinations and modalities to a minimum in order to optimize the work flow. By using quantitative MRI, or CT if the radiation dose is not a concern, a large number of metabolically relevant body composition parameters can be measured with high accuracy and precision in a single examination. A comparison of the capabilities of different measurements of the techniques discussed above is summarized in table 1. There are several methods available that can measure whole-body AT or fat and LT. In terms of precision and accuracy, DXA and MRI are comparable as they show excellent agreement after a linear transformation. However, the agreement is much lower for compartmental measurements such as VAT. Moreover, MRI gives access to accurate and direct measurements of diffuse infiltration of AT in muscles and ectopic fat (eg, liver fat). Rapid MRI scanning protocols, in combination with efficient image analysis methods, have promoted MRI to a competitive option for advanced body composition assessment, thus enabling a more complete description of a person’s body composition profile from a single examination. This research has been conducted using the UK Biobank Resource under Data Access Application 6569. For full acknowledgements, see online supplementary appendix 2. Report of the Task group on reference man: a report Oxford Pergamon 1975;1975. Depots EF , et al.
. Visceral adiposity and its anatomical distribution as predictors of the metabolic syndrome and cardiometabolic risk factor levels. Am J Clin Nutr 2008;88:1263–71.
. Sarcopenia. 2012. Chichester, West Sussex: Hoboken NJ: Wiley-Blackwell. ; Sarcopenia: European consensus on definition and diagnosis: report of the European Working Group on Sarcopenia in older people. United States, North America: Oxford University Press, 2010.
. Human body composition: growth, aging, nutrition, and activity . Verlag: Springer, 1987.
. Use of bioelectrical impedance: general principles and overview. In: Preedy VR , ed. Handbook of anthropometry: physical measures of human form in health and disease. New York, NY: Springer New York, 2012:49–90.
. Reproducibility of DXA measurements of bone mineral and body composition: application to routine clinical measurements. In: Preedy VR , ed. Handbook of anthropometry: physical measures of human form in health and disease. New York, NY: Springer New York, 2012:151–65.
. The gross composition of the body. Adv Biol Med Phys 1956;4:239–80.
. Quantitative abdominal fat estimation using MRI. International conference on pattern recognition, 2008:2137–40. Conf: 19.
. MANA - Multi scale adaptive normalized averaging. Proceedings of the 2011 IEEE International Symposium on Biomedical Imaging: From Nano to Macro, 2011:361–4.
. Fat water classification of symmetrically sampled two-point dixon images using biased partial volume effects. Proceedings of the annual meeting of the International Society for Magnetic Resonance in Medicine (ISMRM 2011), 2011.
. Body composition volumetry by whole-body water-fat separated MRI. ISMRM 22nd Annual Meeting & Exhibition, 10 - 16 May 2014, Milan, Italy, 2014. Contributors MB, JW and ODL planned the work. MB, TR and ODL developed and applied the MR analysis methods used. JDB was responsible for the UK Biobank body MRI and NCH for the UK Biobank DXA scans. MB and JW performed the statistical analyses. SBH contributed with expertise on body composition. MB drafted the manuscript. All authors contributed to editing the text. Funding Funding support for analysis of UK Biobank data was provided by Pfizer. Competing interests MB, JW, TR and ODL are employees and stockholders of AMRA Medical AB. Ethics approval North West Multicenter Research Ethics Committee (MREC), UK.